I just see Job everytime I see him. I miss that show..
That dress should've been pressed at the very least. i never watched the show when it was on, but have recently gotten into it via netflix. oh man, what a great show! and, his character was so ridiculous. i just picture him doing that hilarious chicken dance. that dress is totally unflattering, especially from the side. The fabric reminds me of prom dresses. Yuck. They are a very cute couple. Don't like her dress. Very unflattering to her midsection and bust. And probably one of those satin dresses you have to lie down in when you're in the limo so it won't wrinkle. Yuck on this dress. Agree that it looks prom and badly wrinkled. They do make a cute couple though, I'll give them that. ew. bad fit, bad dress, ew. 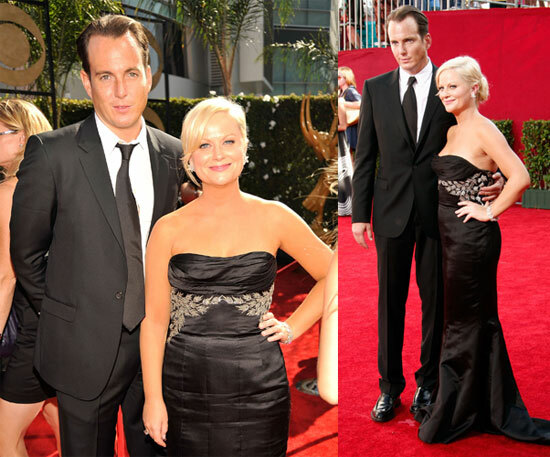 Amy Poehler and Will Arnett have baby boy!